DENVER--(BUSINESS WIRE)--Nov. 21, 2018-- KB Home (NYSE: KBH) today announced its expansion into Northern Colorado with the grand opening of two new commuter-friendly KB Home communities, The Lakes at Centerra in Loveland and Barefoot Lakes in Firestone, this Friday through Sunday. KB Home brings its distinct homebuilding process to Northern Colorado, which allows KB homebuyers to personalize many aspects of their new home to suit their lifestyle and preferences. After selecting their lot and floor plan, a KB Home design consultant will guide a homebuyer through every aspect of the process at the KB Home Design Studio, a retail-like showroom where they may select from a plethora of design and décor choices, including countertops, cabinets, flooring, lighting, appliances and window coverings. Newly designed floor plans will be available, offering KB homebuyers even more choices as they set out to build the home of their dreams. The first of the two new communities, The Lakes at Centerra, is a collection of new one- and two-story homes in Centerra’s master-planned community located in Loveland. Certified by the National Wildlife Federation as a Community Wildlife Habitat, The Lakes is conveniently situated near US Route 34 and Interstate 25, which allows for easy commutes to Fort Collins, Greeley and downtown Denver. Amenities at The Lakes include a clubhouse, pool, 4 miles of walking trails around two lakes, natural habitat, access to kayaks and community gardens. Residents can also attend monthly lifestyle event programs, which are within walking distance of High Plains Environmental Center and a Pre-K through eighth grade STEAM school. Nearby Markets at Centerra, Outlets at Loveland and The Promenade Shops at Centerra offer prime shopping, dining and entertainment. 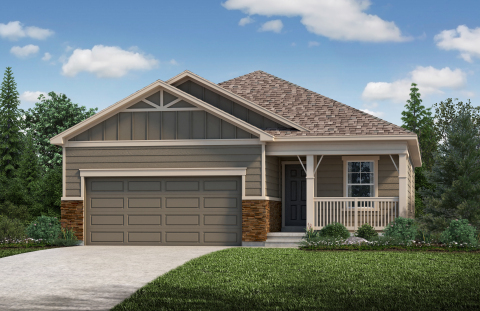 The KB homes at Lakes at Centerra will be available in seven distinct floor plans, which range in size from 1,300 to 2,500 square feet and will include up to six bedrooms and four-and-a-half baths. Pricing begins in the $340,000s. The second community, Barefoot Lakes, is a collection of new one- and two-story homes in Firestone near Interstate 25 and U.S. Route 119 for easy commutes to Longmont, Boulder and downtown Denver. Planned amenities include 3 miles of trails looping around 100 acres of lakes and Peninsula Park, a 12-acre park that will host annual community events and activities. The KB Homes at Barefoot Lakes will be available in eight distinct floor plans, which range in size from 1,300 to 2,500 square feet and will include up to six bedrooms and four-and-a-half baths. Pricing begins in the $360,000s. The KB homes at The Lakes at Centerra and Barefoot Lakes will be built to current ENERGY STAR® guidelines and include WaterSense® labeled faucets and fixtures, meaning they are designed to be more energy- and water-efficient than most typical new and resale homes available in the area. These energy- and water-saving features are estimated to save homebuyers between $672 and $1,092 a year in utility costs, depending on floor plan. Grand opening celebrations for the new communities will be held Saturday and Sunday, Nov. 24 and Nov. 25, from 10 a.m. to 6 p.m. The Lakes at Centerra sales office located at 2817 Cub Lake Dr. in Loveland. From I-25 take Exit 257/US-34 West and turn right on Boyd Lake Ave. Turn right on Long Pine Lake Drive and the community is on the left. The Barefoot Lakes sales office is located at 4639 Clear Creek Dr. in Firestone. From I-25 North, take Exit 240/Hwy 119 heading east. Take an immediate left (north) on I-25 Frontage Rd., which becomes CR-9 ½. Turn right onto Barefoot Lakes Pkwy., left on Eagle River Rd., and left on Clear Creek Dr. The sales center will be on the right. For more information about The Lakes at Centerra, Barefoot Lakes or KB Home’s other new home neighborhoods, visit www.kbhome.com or call 888-KB-HOMES.